About the series First Readers : these books have a vocabulary of approximately 300 words. They are structured in order to encourage active reading: on the left the story, on the right activities. There are exercises and games to revise the student’s grammatical knowledge and test comprehension. by Jean de Brunhoff 11,5x19cm,...more..
About the series First Readers : these books have a vocabulary of approximately 300 words. They are structured in order to encourage active reading: on the left the story, on the right activities. There are exercises and games to revise the student’s grammatical knowledge and test comprehension. 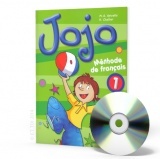 by J.-M. Leprince de Beaumont more..
About the series First Readers : These books with audio CD encourage and motivate learners in three of the basic essentials: reading, writing and listening. The stories are written with a vocabulary of about 300 words. Each book is illustrated, with the text on the left-hand page and with activities on the right-hand page. These are to be done in...more..
About the series First Readers : These books encourage and motivate learners in three of the basic essentials: reading, writing and listening. The stories are written with a vocabulary of about 300 words. Each book is illustrated, with the text on the left-hand page and with activities on the right-hand page. These are to be done in the same...more..
About the series First Readers : these books have a vocabulary of approximately 300 words. They are structured in order to encourage active reading: on the left the story, on the right activities. There are exercises and games to revise the student’s grammatical knowledge and test comprehension. by Dorothy Priest 11,5x19cm, 32...more..
About the series First Readers : these books have a vocabulary of approximately 300 words. They are structured in order to encourage active reading: on the left the story, on the right activities. There are exercises and games to revise the student’s grammatical knowledge and test comprehension. by Doreen Munro 11,5x19cm, 32...more..
About the series First Readers : these books have a vocabulary of approximately 300 words. They are structured in order to encourage active reading: on the left the story, on the right activities. There are exercises and games to revise the student’s grammatical knowledge and test comprehension. by Lance Trembill 11,5x19cm, 32...more..
About the series First Readers : these books have a vocabulary of approximately 300 words. They are structured in order to encourage active reading: on the left the story, on the right activities. There are exercises and games to revise the student’s grammatical knowledge and test comprehension. by Edith Thornton 11,5x19cm, 32...more..
About the series First Readers : these books have a vocabulary of approximately 300 words. They are structured in order to encourage active reading: on the left the story, on the right activities. There are exercises and games to revise the student’s grammatical knowledge and test comprehension. by Edgar Wallace, Karen Day more..